The weather was perfect for cross country and we got to watch some incredible riders and amazing horses tackle some very big fences!! First out this morning were the Amber Michael Leonard Championship class. The leaderboard is unchanged since yesterday and with less than 4 penalties separating the top 6 riders, it’s all to play for tomorrow. Isabelle Odlum has maintained her lead in the Hyde Equine CCNP2* class, with a clear and fast run cross country and has a fence in hand going into tomorrow. Sophie Buller has moved up a place to 2nd and Fionn Clarke has jumped 2 places to lie 3rd at the end of the day. In the Bucas CCIJ1*, the top 3 placings are unchanged, with less than a pole between them heading into tomorrow. 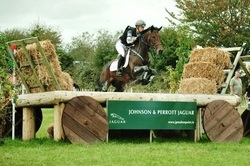 Clear cross country rounds have moved Romy Bolger from 6th to 4th and Aoife Daly from 7th to 5th. Lucca Stubington joins the leaderboard today in 6th place. There’s no change in the Heineken CCI1* leaderboard, with clear rounds today from the top 6 riders. Only 4 penalties separate the 6 and with Sarah Ennis and Jo Aston currently sharing the top spot, none of these riders can afford a mistake! Only one change to the Castlemartyr Resort CIC2* today. Camilla Speirs went clear so she’s moved up to 2nd place, while Fraser Duffy moves down to 3rd. Less than 4 penalties separate the top 5 here, so another nail-biting class in store for tomorrow…. Sam Watson had a good day in the Mervue Equine CCI2* class, staying on his dressage scores and moving into the top spot with Imperial Sky and up a place into 6th on Horseware Lukeswell. He goes into tomorrow with a fence in hand. Jodie O’Keeffe has dropped into 2nd place and Luke Drea is less than a point behind her in 3rd. Wills Oakden (GBR) and Oliver Townend (GBR) have moved up to 4th and 5th respectively. The Johnson & Perrott Landrover 3* classes posed some serious questions today!! In the CIC3* class, we have 3 new entries on the leaderboard. Pippa Funnell (GBR) and Second Supreme have taken the lead after a faultless performance today. Kevin McNab (AUS) has moved up 5 places to 2nd, Michael Ryan jumped 8 places to 5th and Rathmoylan Flight (aptly named!) flew up 10 places to 6th. We are so disappointed for Oliver Townend who retired Imperial Master in the CCI3* class after a run out. Such a shame….but we know they’ll fight another day! Ireland’s Joseph Murphy has taken the top spot, with a lovely clear round today and heads into tomorrow on a score of 50.8 with Sportsfield Othello. Izzy Taylor (GBR) is on 53.2 with Thistledown Poposki and Jonelle Ricards (GBR) is on 54.8 with Classic Moet so that’s yet another really tight battle! It’s going to be really exciting and the new showjumps look great so see you here tomorrow!! !